Henry Heimlich, The Man Behind The Life-Saving Maneuver, Dies : The Two-Way He's credited with saving thousands from choking, thanks to the method he popularized in 1974. Now comes word that Heimlich has died at age 96. 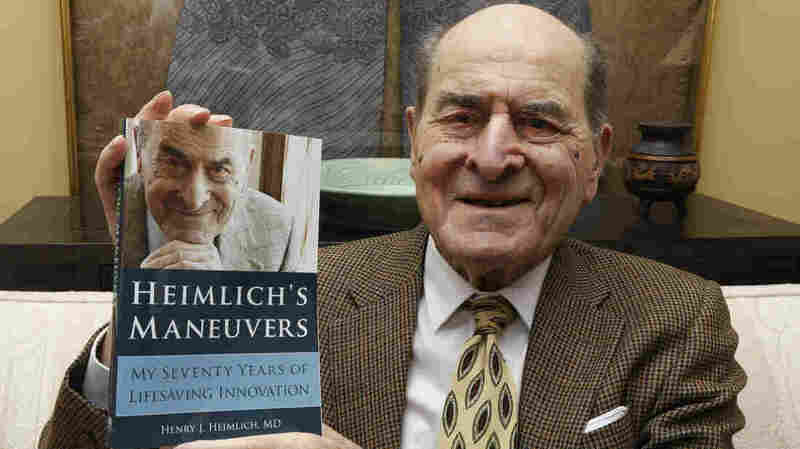 Dr. Henry Heimlich has died in Ohio at age 96. He's seen here in 2014, holding a copy of his memoir at his home in Cincinnati. He's credited with saving thousands of people from choking to death, thanks to the method he popularized in 1974. Now comes word that Dr. Henry Heimlich has died at age 96. Heimlich died early Saturday at Christ Hospital in Cincinnati, Ohio, according to Bryan Reynolds, spokesman for Episcopal Retirement Services, which operates the retirement home where the physician lived for years. According to Reynolds, Heimlich was experiencing complications from a massive heart attack he suffered in his home Monday. Since its invention, the Heimlich Maneuver has become both a life-saving tool and a part of modern culture. It's uncertain how popular it would be if the move was still known by its original term: subdiaphragmatic pressure. As Heimlich told NPR back in 1999, that's the name he assigned the method when he described it in a medical journal in June of 1974. That original name didn't last long. As Heimlich said, "the editors of the Journal of the American Medical Association called me, and they said, 'We have found that so many lives have been saved in less than two months, we would like to name this after you.'" By 1980, he said, the Heimlich maneuver had gained enough prominence to be an entry in foreign-language dictionaries. The thoracic surgeon famously used his own maneuver earlier this year to help a fellow resident at his retirement home — an 87-year-old woman who began choking on a hamburger during dinner. "As a young surgeon, Dad was the first American to devise and perform a total organ replacement. Later, he came up with a device that saved thousands of soldiers' lives during the Vietnam War. The Heimlich Chest Drain Valve is still used worldwide for patients undergoing chest surgery. "Dad was firm in his convictions and passionate for his causes. He didn't play politics well. Instead, he was single-minded in his quest to find better ways to save lives. Dad dreamed that anything was possible in the field of medicine, even when critics said otherwise." Some of those critics focused on Heimlich's theory of malariotherapy, in which malaria is induced in people suffering from HIV, Lyme disease and other conditions with the goal of using malaria's high fevers to help patients. Heimlich has acknowledged performing such research on HIV patients in China, telling Boston.com in 2014 that he feels the idea deserves to be researched. Other disagreements have centered on the use of the doctor's eponymous maneuver. The Red Cross says it should be used only after slapping a choking victim's back, for instance, and the Red Cross and other organizations have also said drowning victims should get mouth-to-mouth resuscitation rather than the Heimlich maneuver. The Heimlich Maneuver is relatively simple to perform; it's also been deployed to rescue people from Carrie Fisher and Cher to President Ronald Reagan and New York Mayor Ed Koch, as Radiolab has reported. "There are several positions. Now everybody knows where you stand behind the person, put your thumb inside of your fist just above the bellybutton — remember, below the chest. And you grasp your fist with your other hand and you press inward and upward. Now you repeat that until the object comes out. "But it also can be done with a person lying down on their back. You kneel astride their thighs and put one of your hands on top of the other, and the heel of the bottom hand just above the bellybutton, and press your weight in. And that's how children have saved their parents. In addition, its widest use now is to save drowning victims." Heimlich also noted that people can perform the maneuver on themselves — either with their hands clenched together or by using the back of a chair, positioned between the belly button and ribs. You can see examples of the maneuver in videos from the physician's Heimlich Heroes website.